Eating a raw seal for lunch should have been another tipoff. 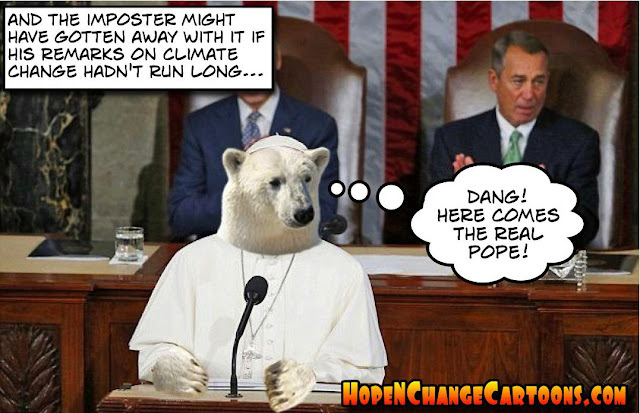 Hope n' Change doesn't really have a lot to say about the Pope's remarks to Congress yesterday, because, in stunning contrast to most alleged journalists, we actually admit that we neither watched nor read his full remarks. Oh, we got the gist: some genuinely nice sentiments, some unrealistic policy recommendations, a little specious science here and there, and a nice dollop of actual moral conviction (which is always welcome in Washington, if only for its rarity). Lawmakers gave smatterings of cautious applause whenever their personal oxen weren't being gored by a Papal bull (the Republicans got lectured about their heartless stance on immigration, while the Dems got some finger-waggling about unlimited abortion and threats to traditional marriage). Sitting directly behind the Pope, Joe "At Least I'm Not Hillary" Biden nodded seriously and tried to look presidential while John Boehner wept like a baby and dabbed away tears which were stained orange by his spray-on tan. While Hope n' Change doesn't agree with all of the Pope's policies and pronouncements, we still think it was worthwhile to have him speak. After all, how refreshing is it to hear from a man of the cloth rather than politicians whose pronouncements are rendered from whole cloth? BREAKING NEWS: BOEHNER RESIGNING! HONEST! 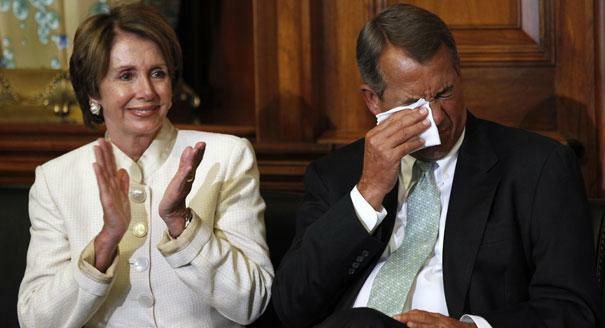 Maybe we were on to something when mentioning John Boehner's streaky tears. He's just announced that he's resigning from the House Speakership and Congress, effective the end of next month. The secret to not crying in public? Botox - and plenty of it. Yesterday, Democrats defeated a Republican bill which would have made the most horrorific late term abortions illegal. And by "late term," we're largely referring to infants who could possibly survive outside the womb with proper medical care (22 weeks being the age cited by the NY Times referring to a new New England Journal of Medicine study). Unlike the Cowardly Lion getting a haircut in Oz, a late term abortion is no simple "snip, snip here, snip, snip there" operation. Rather, it involves taking an infant and giving it the full ISIS treatment - ripping off arms and legs, slicing spinal cords, and decapitation. And in partial birth abortion, the child has largely already been delivered before the slaughtering begins. Of course, late term abortions are very, very, very rare - only happening about 18,000 times a year. Or perhaps more if the price of Lamborghinis goes up. So what does this have to do with Ahmed the alleged clockmaker? Plenty - and not just the "parts is parts" comparison made in the cartoon above. 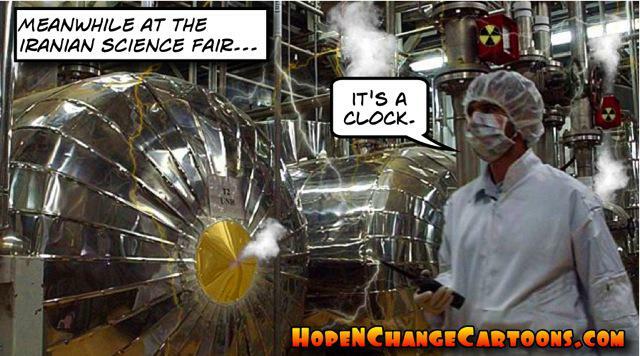 Obama tweeted "Cool clock, Ahmed. Want to bring it to the White House? We should inspire more kids like you to like science. It's what makes America great." 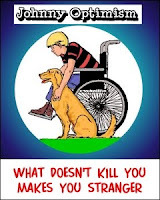 Only you can't really "like science" and like late term abortion, because the science says that the young victims are fully capable of feeling every bit of the pain and agony of being dismembered alive. And the science says that mothers are 35 times more likely to die from late term abortions than abortions performed in the first trimester. Ignoring science doesn't "make America great," Mr. Obama. But it does win a lot of bloodsoaked votes for Democrats from people who don't give a damn about human life. The mainstream media continues to praise young Ahmed Mohammed, the Muslim genius who "invented" a digital alarm clock (will wonders never cease?) by removing the guts from an old Radio Shack digital clock and shoving them into the most suspicious-looking case he could find. One of the dumbest political stories to get traction in recent days (and trust us, that's a pretty high bar to clear) relates to a townhall meeting in which an audience member referred to Barack Hussein Obama as a Muslim and - horror of horrors! 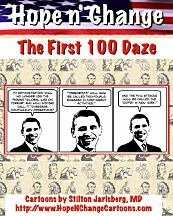 - Donald Trump didn't immediately declare that Barry is actually a Christian and, in all likelihood, the Second Coming. 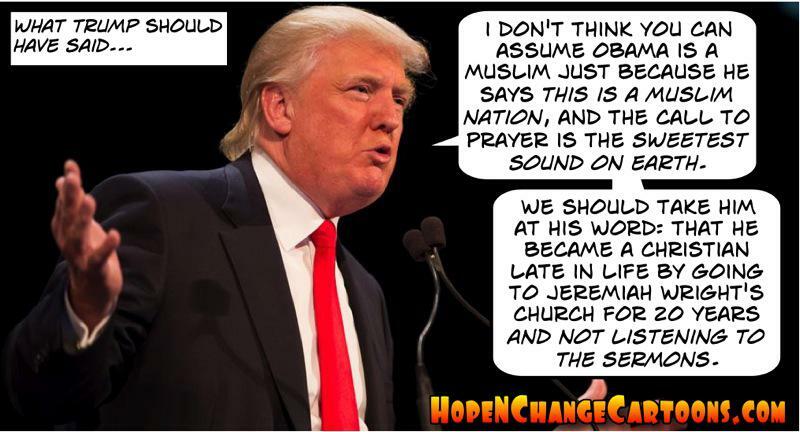 Granted, Obama is widely known for his declarations that when times get tough he'll "stand with Islam," that "the future must not belong to those who slander the prophet of Islam," that ISIS ("Islamic State") is not Islamic, and that Christians in flyover country are bitter little people who "cling to guns and religion." But he also says that he's a Christian (albeit one who avoids church like the plague, seems awfully vague on Scripture, and has been instrumental in ramping up government harrassment of Christians) - so where does the truth lie? And why is it Donald Trump's job to figure out whether to believe Obama's words or his actions (you can't do both) and explain it to everyone else? The always-brilliant Mark Steyn has a lot to say on the subject and you should definitely follow the link to his piece. Even though we at Hope n' Change aren't religious, when Steyn brings down Hell and damnation on the hypocrites pushing this story, he makes us believe.